His Divine Grace Srila Bhakti Ballabh Tirtha Goswami Maharaja is the President-Acharya of the Sri Chaitanya Gaudiya Math and the Founder of GOKUL-Global organisation of Krishnachaitanya’s Universal Love. He is the 11th Acharya in the preceptorial channel (Guru-Parampara) of Lord Sri Krishnachaitanya Mahaprabhu. Born on April 24,1924 at Amlapatti-Gwalpara, Assam, India, Srila Bhakti Ballabh Tirtha Goswami Maharaja joined the Gaudiya Math institution in 1947 after completing a Masters Degree in Philosophy at Calcutta University. 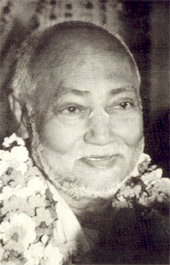 He served the Sri Chaitanya Gaudiya Math as its Secretary and took Sannyas in 1961. After the disappearance of His beloved Gurudeva, His Divine Grace Om Vishnupad Srila Bhakti Dayita Madhava Goswami Maharaja ji, as per His nomination and direction, Tridandi Swami Srimad Bhakti Ballabh Tirtha Maharaja became the President-Acharya of the Math in 1979. Working eighteen hours a day, He is incessantly engaged in the propagation of the Divine Message of Sri Krishnachaitanya Mahaprabhu. Srila Bhakti Ballabh Tirtha Goswami Maharaja is acknowledged by Vaishnavas around the world as one of the most exalted spiritual personalities of the second generation (Prashishya-Varga) of preceptors descending from His Divine Grace Nityalila Pravishta Om Vishnupad Srila Bhakti Siddhanta Saraswati Goswami Thakur. His Divine Grace is an authority on Gaudiya Vaishnava philosophy. He never deviates even one centimeter outside the four corners of the prescription of the shastras (holy scriptures). “Example is better than precept” is His way of preaching. For the last five decades, Srila Bhakti Ballabh Tirtha Goswami Maharaja has been engaged in the propagation of the all-embracing doctrine of transcendental divine love of Lord Sri Krishnachaitanya Mahaprabhu, to counter the present trend of violence and cruelty, and to bring about unity of hearts among all, irrespective of caste, creed or religion. At the behest of His Beloved siksa-guru, His Divine Grace Nityalila Pravishta Om Visnupada Paramahamsa 108 Sri Srila Bhakti Pramode Puri Gosvami Maharaja, He has now embarked upon preaching the message of Sri Chaitanya Mahaprabhu throughout the entire world, beginning with an American tour in 1997. Since that time, He has continued to bring the yuga-dharma of the Divine Name throughout the world. To date, His preaching engagements have taken Him to England, Holland, Italy, Austria, Germany, France, Spain, Russia, Slovenia, Ukraine, Austalia, Singapore, Bali, the Hawaiian Islands and throughout the length and breadth of the continental US. During this time, He also maintains an extremely heavy preaching schedule, of three to four programmes a day, as He continuously travels to the devotees throughout the Indian subcontinent. He is the author of many devotional books including - Associates of Sri Chaitanya Mahaprabhu, Saints of India, Affectionately yours and Shuddha-Bhakti. His Divine Grace is also presently engaged in writing articles and books of a profoundly spiritual nature in His native languages as well as in English, for the eternal benefit of the conditioned souls of the world. His Divine Grace Srila Bhakti Ballabh Tirtha Goswami Maharaja is beloved by thousands of devotees throughout the world as the very embodiment of humility and spiritual affection. "We are fortunate enough to get this precious human birth after cycles of births. We should utilize this birth for our eternal good. You are not to kill yourself, but you are to kill bad motives, bad thoughts." "We should take absolute shelter at the Lotus Feet of Gurudeva who will be indicated by the attributes of being well versed in the Vedas and equivalent scriptures, receiving transcendental Divine message through preceptorial line, as well as having realization of the Divinity." "It will not be wise to devote out valuable time and energy of this precious human birth for mundane affairs and mundane temporary benefits. Efforts in this world will not produce lasting result." There is no difficulty in the worship of Sri Krisna, as He is nearest and dearest. He is residing within our hearts. He does not see mundane merits. He sees the sincerity of our hearts whether we actually want Him or not. One who sincerely wants Him, will surely get Him. You submit all your prayers to Him sincerely. He will fulfill your desires." Sreela Vishvanath Chakravorty in his commentary explained the characteristics of a Bonafide Guru. Gurudeva should be well-versed in the Vedas and other allied scriptures. An aspirant disciple cannot progress in his worship of God without taking shelter of a really qualified Bonafied Guru, who should have the capacity of removing the doubts of disciples by reasoning substantiated with evidence from authentic scriptures. If Gurudeva is incapable of removing the doubts of the disciple, the disciple's belief in Him may slacken. The second characteristic of Gurudeva is that He should have realisation of the Divinity. Only by theoretical knowledge of the scriptures, without having practical realisation, Spiritual Guide cannot give proper advice and direction in accordance to the eligibility of the disciple. By the instruction of a Guru possessing the quality of practical realisation, the disciple can have actual spiritual progress. It is to be considered here, a disciple can have the capacity to comprehend scriptural knowledge of Gurudeva by hearing from Him; but how can a disciple understand whether Gurudeva has got realisation of Divinity or not? Supreme Lord is Transcendental Reality, His Absolute Counterpart Gurudeva is also Transcendental. Therefore, a neophyte votary cannot understand Gurudeva's realisation of Divinity by his own endeavour. There are two aspects of Supreme Lord and His Absolute Counterpart Gurudeva — (1) morphological aspect and (2) ontological aspect. Conditioned souls can by their mind, intellect and sense-organs grasp the morphological, i.e. the external aspect of the thing — thing as it appears — and not the thing as it is. The thing as it is, can be realised only by the grace of Transcendental Realities, through unconditional complete surrender. As for example the self-luminous sun can only be known by it's own light and not by the help of other lights. We can not see sun in the night with the help of other lights, but when sun rises, by accepting the grace of the sun—it's light— we can see the sun and all things of this world in the proper perspective. Supreme Lord and His Absolute Counterpart Gurudeva are self-effulgent. Sree Vishwanath Chakravarty Thakur, in his commentary, has given to the bonafide neophyte aspirants, a clue to recognise Guru by one external quality - a Bonafide Guru is not subdued by passions— anger, greed etc. Of course, realised soul can use the passions for the service of Supreme Lord and for the eternal benefit of conditioned souls, but He can never be subjugated by them. Sree Narottam Thakur has advised us how the cardinal passions can be used for the service of Sree Krishna, except for malice —`kama krodha¸akaram¡rpa¸, krodha bhaktadv®À¢jan®, l°bha s¡dhusa´g® harikath¡, m°ha iÀal¡bhavin®, mada k¤À¸agu¸g¡ne niyukta kariba yath¡ tath¡'. Kama —passion for fulfilment of desires should be diverted to desire to serve Krishna, `anger' should be used against those who are hostile to devotees, `greed' should be employed to increase the desire to hear Hari-Katha from a bonafide sadhu, `infatuation' should be over not being able up till now to utilise the valuable time of this precious human birth for worship of Sree Krishna and `madness' should be after singing the glories of Sree Krishna. Even Narada Goswami, out of compassion, used anger on the sons of Kuber- Nalkuber and Manigriva- to rescue them. According to Gita, the cause of anger is obstruction to fulfilment of one's desire. A real devotee cannot have any desire of his own except service of Sree Krishna. So, in a pure devotee, there cannot be any possibility of the origination of such anger due to hindrance to worldly desires. Never forget to give respect and pay obeisances to your parents. It is out of ignorance we blame others for our distress. The wise do not blame others for their sufferings. We reap the fruits of our own actions, others may be instrumental. Always remember the teachings of Sree Suniti Devi to tolerate than to retaliate. No man in this world can be identical with another. Differences exist in their births, actions and association; in nature they will be different. It is impossible to make the environment adjusted to me. I am to adjust myself with the environment. Nobody can remain in peace in family or society without tolerance. When we resolve to do one thing and when there is an obstruction to it we become unbalances. By non-determination (Asankalpa), we can conquer desires, and by conquering desires, we can conquer anger. "A bonafide-surrendered soul has got no worries as he has got firm belief - Sree Krisna will protect and sustain him under all circumstance. The world is the Prison-House for the punishment of culprits who are averse to Sree Krisna. We cannot get permanent peace in this Prison-House, it will always remain disturbed. It is not known how far people of the world will be benefited by my presence. Supreme Lord Sree Krisna is All-Good; whatever is done by His Will is for the eternal benefit of all. Total submission to the will of Sree Krisna is the only way to get peace. This world is the prison-House for the punishment of those who are averse to Sree Krisna. This is not the place of our permanent stay. We lose nothing if any of our desires is not fulfilled. Love of Krisna will go with us, everything else will remain here. The root cause of our afflictions is forgetfulness of our relation with Sree Krishna. So to eradicate the root of the sufferings- three fold affilictions, we should submit ot Sree Krishna completely and unconditionally. We are to accept all that is congenial for pure devotion. Give up all that is not congenial. Should have firm faith that Sree Krishna will protect us under all circumstances from outside foes and inside foes (passions). He is the only Sustainer and Maintainer of our real and apparent selves. We all belong to Him, i.e. we are of Him (Atmanibedan). We should give up all material egos-think that we are spiritual sparks-minutest parts of the marginal potency Tatastha Shakti ) of Supreme Lord Sree Krishna, i.e. we should not mundane vanities-we should be humbler than the blade of grass. Saranagati is the best medicine for cure of all afflictions and for solution of all problem.